Before moving to the southeast corner of our state, Mr. Squash and I lived north of Seattle in Everett. Whenever we would get a big snowstorm, it was called a "Snow Event", most likely because since around the 1970's it's been rare to see any snow in the winter - let alone a big snowstorm! One morning over there we woke up to a huge amount of snow on the ground. Schools and businesses closed and even the county government which was quite near to where we lived let people go home early. The local TV news superseded any regular TV programming, and they would position reporters on street corners all over the area! We affectionately called them "Parka People". One evening while having dinner we were watching the news only to see one of the Parka People on the corner right outside our front door! Now that was a hoot! 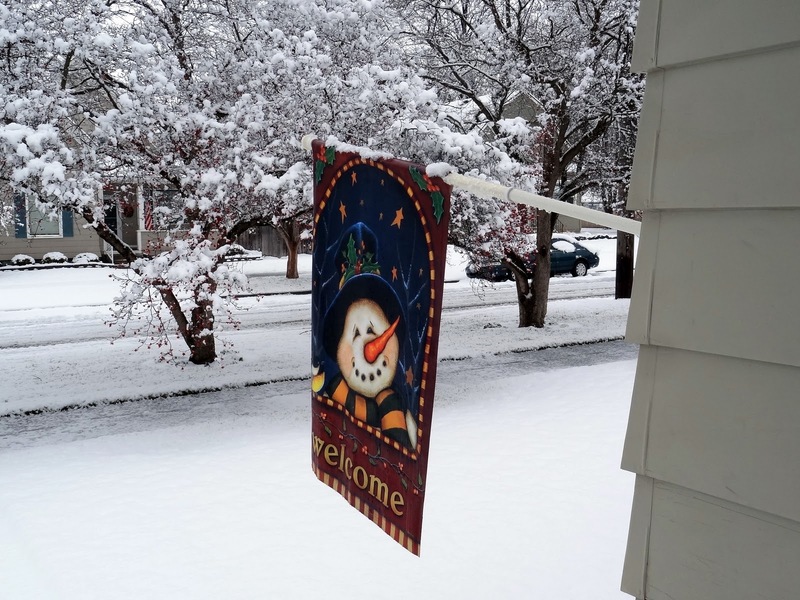 As many of you have heard, the entire state had quite a Snow Event yesterday and the day before! 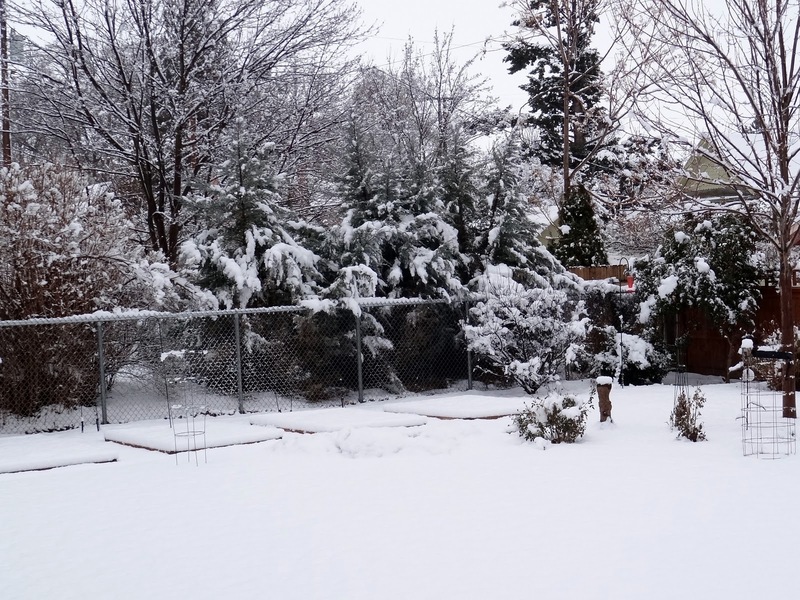 Here is what our front yard looked like yesterday morning. We got a lot less than the greater Seattle area, which is not to say more fell overnight here. It's not over yet! It's been kind of fun to watch Northwest Cable News today as they have had our old news station on all day and most of the same Parka People are still standing on street corners! Here is the view in the backyard looking over to the neighbors. The snow fell heavy, wet and fast and by afternoon the temps went from 35 to 25 in a very short time and stayed there! I fear for delicate new plantings like my little willow tree. I probably should go out and knock that snow off the tree. We keep checking out the window, but alas, no Parka People in our neighborhood! I guess folks around here just don't consider this unusual! 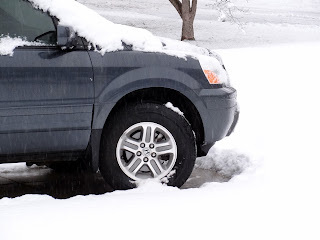 As you can see, my car hasn't left the driveway yet. We tooled around town yesterday in Mr. Squash's wonderful Jeep with the big tires. It comes in quite handy for this kind of weather! A winter snowfall is so beautiful when looking out from a warm toasty house. Especially if you don't have to get out and drive to work. A good sew day. It's so pretty! we haven't had any snow yet, and i want some! Stay cozy. I'm in Seattle and it's STILL snowing...Haven't been out for two days and I think I'm getting cabin fever. All the schools and colleges are closed and all the kids (and their friends) are congregating at my house. I might have to hike out today. Stay warm! I like the snow better at your place than ours, Candace. Ours is all gone...again! Yesterday the temperature reached 48° here which is unheard of in January...even in hardiness zone 6b. I know the snow shoe is about to drop any day now but it is sure nice to see the grass without any white stuff on it. Oh my goodness so that's where all the snow is that Ohio isn't getting. :o) That heavy stuff is really hard to shovel. I prefer the light, fluffy stuff. It's really beautiful when it's fresh and new. Enjoy your snow and let us know if you see any Parka People. DON'T knock the snow off your tree. 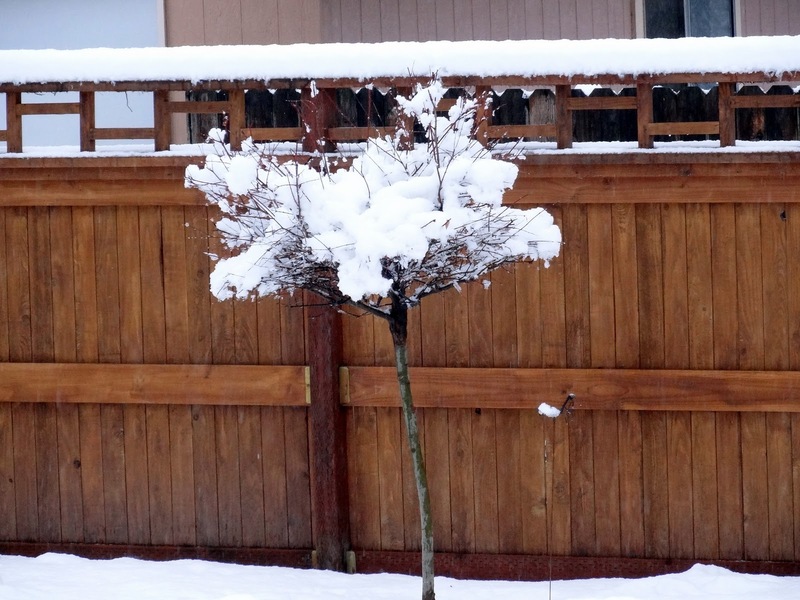 The snow is actually insulating the tree from the cold air. If you're really worried, call your local nursery and ask them for advice. Pretty pictures! I'm just north of Portland and we had a couple of inches fall overnight, but by morning it was raining. And that's all it's done since - rain. We got about 5 inches of snow overnight and by midmorning the temps had gone into the high 30's turning the snow to rain and we had a huge mess! Still raining here and the snow is all gone! Weird winter! Ha...my word verification is flyclas. Perfect for you! Plenty of snow here on the Palouse, with more falling as I type. Dan just plowed our driveway and our neighbor's again. I'm loving being snowbound today. Hope to get some fun sewing done! we ended up with 6-8" here in the Tri Cities and now the freezing rain has come with a vengence! The courthouse is shut down for the weekend (only the 2nd time that has happened in 10 yrs!) The snow makes me happy and it's beautiful, heck I don't even mind driving in it...but the freezing rain can go away! Wow, I'm in south Fl and can't imagine that much snow. However, it looks very nice at the Squash House. I have a friend from high school that lives in Anacortes and he has been posting lots of pictures on Facebook. It's all very beautiful. I wonder what the Squash House gardens will produce this coming spring / summer. Hmmmm. Your snow looks nice, not too much of it. 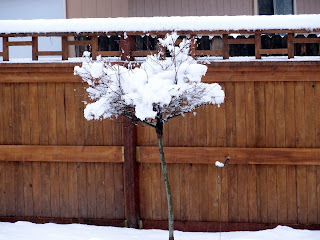 I would shake some of that snow off your little tree before it gets wet and heavy and breaks the branches. We must shake our hawthorn hedge before it starts beding over to one side under the snowload. I love looking at the snow (as long as I can stay in my sewing room - and don't have to venture out!). We are supposed to get another inch or two of the white stuff today. Hope you are staying in where it's warm! I like what Me and My Stitches said. I love to look at snow from inside. But alas, that doesn't happen much in Oceanside. Happy Winter! Around here we get 'Storm Watch' whenever we are about to be pummeled by a heavy mist *lol* Rain in the forecast send them out into the streets to report. Makes us laugh every time. Plenty of that white stuff up our way as well. Tucked away in our little corner of the Pacific Northwest. Finally ventured out on Friday for much needed errands. Like replenishing the chocolate..just kidding on that one. Finally stopped in at my favorite quilt shop in Bellingham and now all is right with my world. Even without chocolate. Kevin and I do wonder though why oh why did we let our beautiful snow blower go with the house in Mammoth! Not smart...the sun on the snowy covered pasture is beautiful.